Great news from the Humane Society Of The United States, they have started a tipline to help dogs being abused at puppy mills. While there have been tiplines for dog fighting for a while there was not one specifically dedicated to report puppy mill abuse. (Dec. 3, 2009) – To help end the misery associated with large-scale dog breeding operations known as “puppy mills,” The Humane Society of the United States has launched a national telephone tip line and encourages callers to report suspected cruelty or unlawful activities involving such breeding facilities. The Wilde Puppy Mill Task Force investigates puppy mills and works with law enforcement, animal shelters and other agencies to stop abuse and to ensure enforcement of existing laws. The task force also provides expert guidance to local, state and federal agencies in the prosecution of animal abusers as it relates to the operation of puppy mills. Since its launch in June, the Task Force has assisted in the rescue of more than 1,200 dogs and puppies from abusive situations at puppy mills. The announcement of the new national tip line comes during The HSUS’ 3rd annual Puppy Mill Action Week, which is dedicated to educating the public about how to find a new best friend without supporting the abusive puppy mill industry. Puppy Mill Action Week runs Nov. 30 through Dec. 6, at the start of the peak holiday puppy buying season. The Wilde Puppy Mill Task Force is named in honor of Kenneth and Lillian Wilde, who donated a portion of their estate to The HSUS to help dogs. Thanks to the Wildes, The HSUS was able to expand the organization’s capacity to rescue more animals from the inhumane puppy mill industry and to raise national awareness of the pain and tragedy that can lurk behind the inviting visage of a young puppy for unwary buyers. · The HSUS supports compassionate breeders who provide for their dog’s physical and mental well-being. Quality breeders don’t sell puppies through pet stores or over the Internet. Oprah’s show on puppy mills aired back in April 2008 making the public, most for the first time, aware of what a puppy mill is. Although I knew you shouldn’t buy pets from a pet store I really had no idea the reason behind it, I didn’t know what a puppy mill was. I could never have imagined the horrific conditions and horrible abuse these dogs suffer without seeing it with my own eyes. As hard as the Oprah show was for people to watch once the puppy mills ‘dirty little secret’ was out there was no going back. Thankfully since the show there have been raids of abusive puppy mills, changes in legislation, and new laws. 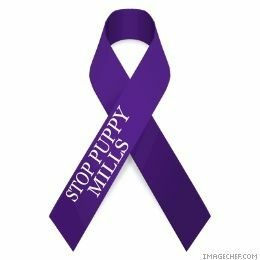 While we still have a long way to go, each step like the new tipline, gets us a little closer to hopefully one day ending puppy mills altogether.